Someone recently told me that they were looking for suggestions for a brunch spot in Toronto. I am somewhat of a brunch aficionado. My sister, cousin and I have a monthly engagement we call “Cousins’ Brunch”. Every 4 weeks, we each take turns choosing a restaurant that we haven’t tried before. Here are some of the best brunch places I enjoy. I walk by this restaurant a thousand times on my daily trek on Bloor Street. In the summertime, their patrons look like they are having the time of their lives on the patio. I love the French-inspired decor of this restaurant, it reminds me of the cafes I went to when I was in Paris. 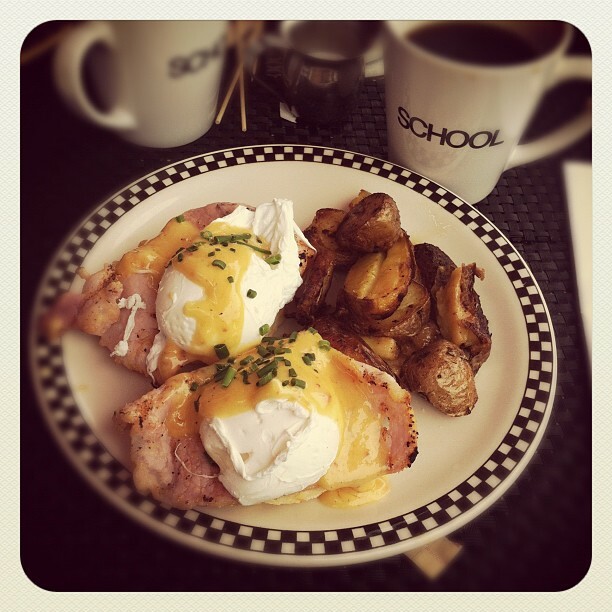 Also, the price points are very affordable – my eggs benny and coffee come up to less than $20. 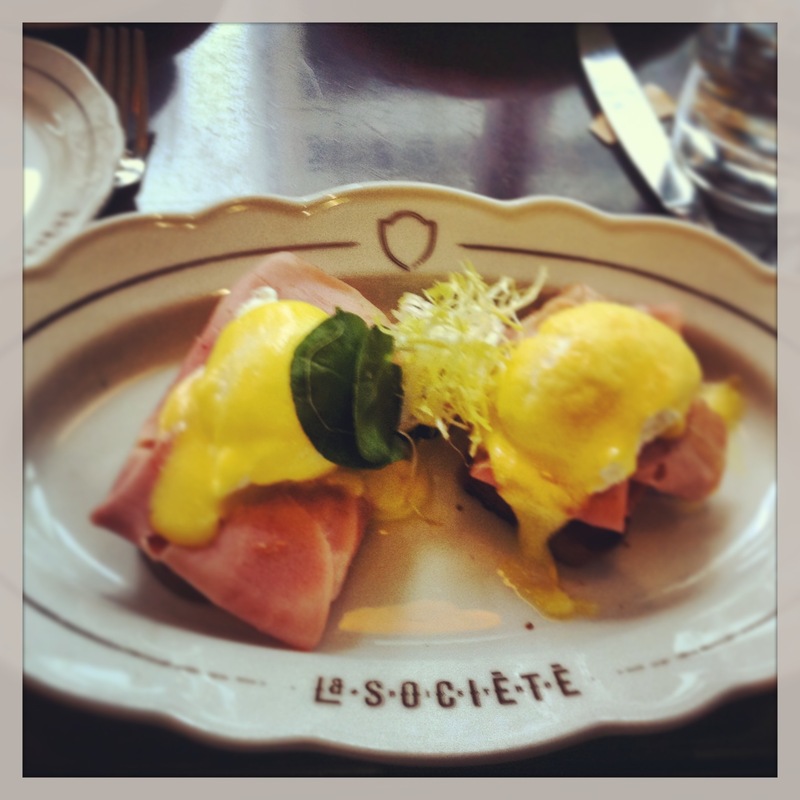 I haven’t yet eaten at La Société for dinner, but I plan to this summer. I had a great time here when I ate this Liberty Village restaurant last spring. As the name suggests, the place is fashioned somewhat like an educational institution – the menus are on ruled paper, the waitresses are wearing kilts and there was a wall of clocks like the ones you had in your grade 3 classroom. 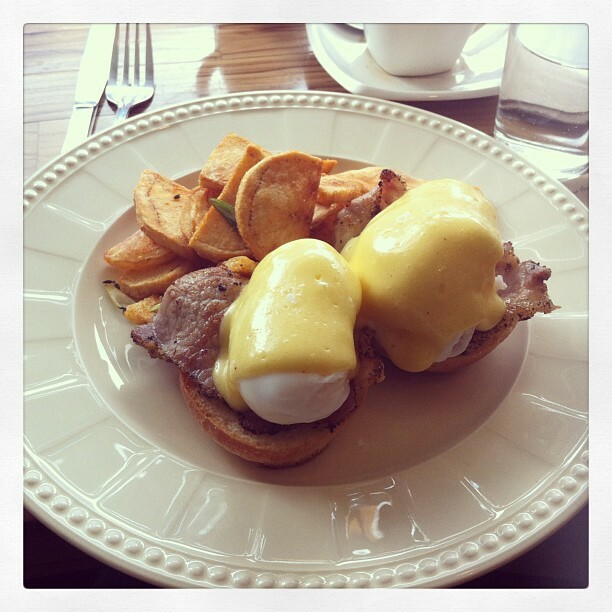 My eggs benny was on a cheesy biscuit, back bacon and the best homefries I’ve ever had the pleasure of eating. I really enjoyed this gem of a café in the Danforth & Broadview neighbourhood. Specialty treats are sold in addition to meals, with every edible looking absolutely delectable. It was here that I had my first duck eggs benny, which added a nice little twist. Also, the chip-style home fries were quite yummy. I really seem to like eggs benny! I recommend them all! They all have such different feels, which is nice. Oh and at School, try their scones – they are so delicious! I know, right? So tasty!